Qusayr, a strategically important town in Syria, has been recaptured by Bashar al-Assad’s forces, who are being aided by Lebanese terrorist group Hezbollah. The town — located along major supply routes in between Damascus and the Mediterranean — was the center of intense clashes between the two sides over the past two weeks. 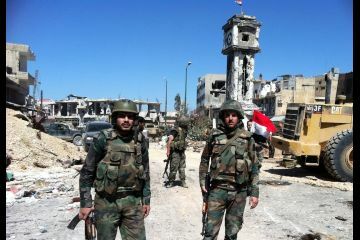 Syrian TV reported that the rebels withdrew overnight, and had suffered large casualties in the battle. Many also surrendered during the final offensive by the government’s forces. The Syrian Observatory for Human Rights, a British-based organization, also confirmed that Qusayr had fallen based on reports from activists and medics on the ground. “We will not hesitate to crush with an iron fist those who attack us. … Their fate is surrender or death,” the statement added. Syria’s bloody two-year civil war has left upwards of 80,000 people dead, and has spilled over into neighboring countries both in its sparking of sectarian violence and the thousands of displaced Syrians seeking refuge. Fighting was still ongoing in Dabaa and Buweida Al Sharqiya, the last village in the area under rebel control.